Born in Haiti, Jean-Baptiste Pointe DuSable (ca. 1745 – 1818) is credited as the first citizen of Chicago. His father was a French sea captain and his mother a slave of African descent. DuSable settled by the Chicago River, developing a prosperous trading post around 1779. That little settlement became the great city of Chicago. 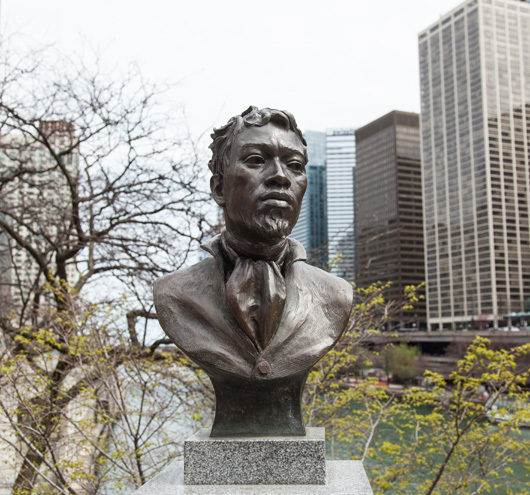 Today, the site of DuSable's trading post is marked with this bust. DuSable was highly educated and became a fur-trading entrepreneur. As he travelled across America, he developed a real affinity for Native Americans and lived among them. In the late 1700s he married Kittihawa, daughter of a Potawatomi chief. For many years DuSable’s contributions went largely unnoticed. Today he is properly honored with this monument, a park and the DuSable Museum in Washington Park, the nation’s first African American museum. For more about the Goodman Theatre, click here.